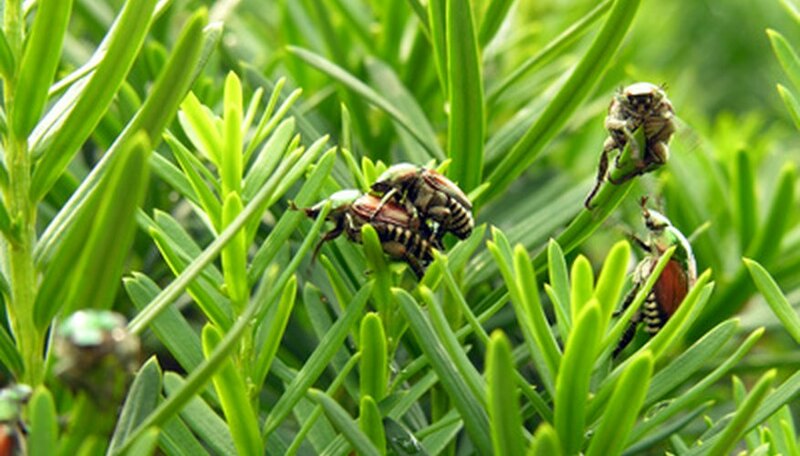 If Japanese beetles are pestering your plants and you’re seeing their nasty bites taken out of stems and leaves, then you’ll want to stop the infestation as fast as possible. The best way to get rid of Japanese beetles is to catch them as early as you can, but no matter the size of the problem, there is always a way to attack them. Depending on the extremeness of your beetle problem, often you can start small and work your way up if the Japanese beetles persist. Treat light sightings of beetles as soon as possible by hand picking the beetles from your plants and placing them in a jar or plastic container. Leave the jar sealed for a few days until the beetles die off. Place the dead beetles in to a bucket half-filled with water and a scant teaspoon of dish washing liquid, well mixed but not sudsy. The scent of the dead beetles should ward off other beetles still in search of food. Leave the bucket in the garden for three to four weeks until the beetle season has passed. Lure beetles to where you want them in your garden by planting white geraniums two feet away from the plant you want to protect. Once the beetles dine on the geranium they should become paralyzed and drop to the ground where you can collect them. Apply an insecticide to the damaged plants if the infestation is taking over and steps one through three haven’t been successful. Products like Neem, rotenone and Sevin should be able to rid you of the beetles, but follow the directions on the packaging carefully, especially when using around children and pets. To get the collection job going, turn the task into a contest and have helpful children each take a jar or container. Award a prize to the child with the most beetles collected. There are Japanese beetle "traps" available on the market which have scents that mimic females and/or food plants the beetles enjoy. While you can use these, there are speculations that they actually draw more beetles to your garden, increasing your chances of having beetles.